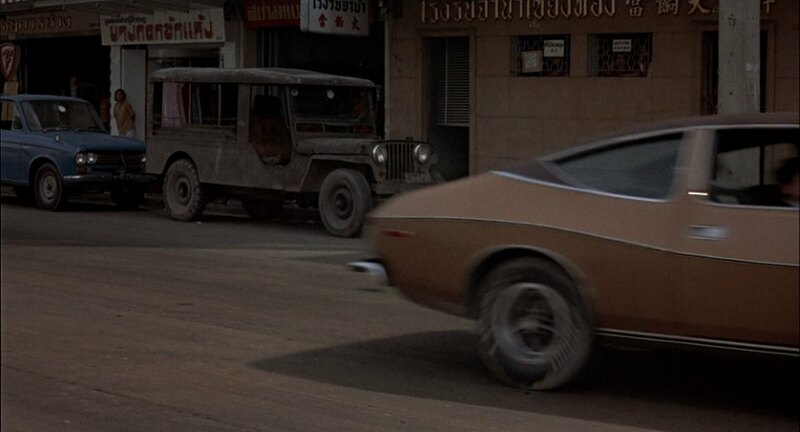 IMCDb.org: Mahindra CJ-4 in "The Man with the Golden Gun, 1974"
Adding to the confusion surrounding the Jeep CJ4 was the fact that Willys had licensed Jeeps to be built in India by the Mahindra and Mahindra Company. The East Indian company produced a longer wheelbased Jeep Universal sold as a CJ4 into the 1990's. Needless to say these CJ4's are seen mostly in Europe and Asia, yet they are not recognized in the U.S. as CJ4's...being known by there manufacturer's name as Mahindra Jeeps. Should this have India origin flag on this?